Sense.ly has created a virtual nurse named "Molly" that provides personalized monitoring and care. Sense.ly is the breakthrough “virtual nurse” that provides proven, personalized monitoring and follow-up care, with a strong focus on patients with chronic diseases. Sense.ly combines innovative avatar-based technology and advanced sensor capabilities that generate actionable, real-time data and intelligent analytics, enabling clinicians to make better, timelier care decisions. The Sense.ly solution empowers clinical practices to scale and succeed in the midst of historic challenges from healthcare reform, declining reimbursements and technology disruption. For patients and their caregivers, Sense.ly provides high quality care with the level of trust, confidence, and comfort they want and deserve, even between office visits. For payers, Sense.ly is helping to improve health outcomes and patient satisfaction while lowering the total cost of care. Current customers include major providers and payers. Molly uses gesture capture based on Microsoft's Kinect as well as a Nuance-powered speech recognition engine. Together, this allows the platform to analyze a patient's condition and provide insights into what steps patients should improve their health. 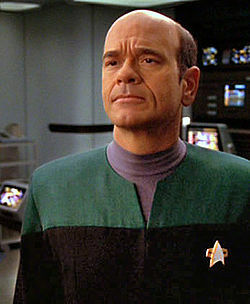 SF fans may be thinking of The Doctor, the Emergency Medical Hologram from Star Trek Voyager. The EMH is a computer program that treats patients when medical help is otherwise unavailable. There are older examples, of course. Consider the autodoc from Larry Niven's 1970 novel Ringworld, which treats as well as it examines and diagnoses. It's a bit more limited, but the electronic body analyzer from Michael Crichton's 1969 novel The Andromeda Strain does a pretty good job with a physical exam. And don't forget about the robot surgeon from Isaac Asimov's 1976 novel The Bicentennial Man.